The Mutianyu section of the Great Wall is a masterpiece of restoration, with 23 original-style watchtowers. Mutianyu is the longest fully-restored Great Wall section open to tourists. Distance from Beijing: 73 kilometers (45 miles), 1½ hours drive. Restoration: Completely rebuilt to its original glory for your safety and enjoyment. Hotels: Brickyard Eco Retreat, Home of the Great Wall. 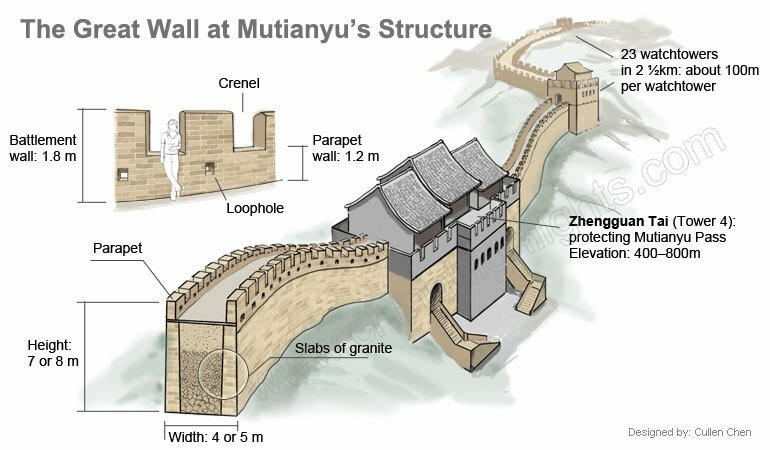 Where is the Mutianyu Great Wall Section? Mutianyu Great Wall is in Huairou Country, 73 km (45 miles) north of central Beijing, about 1½–2 hours&apos; drive. 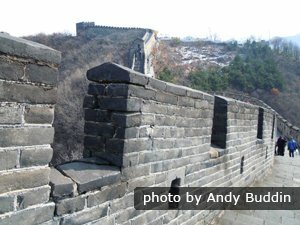 This section of wall connects the Jiankou Great Wall section in the east and the Baima Pass section in the west. The Mutianyu Great Wall was first built by the Northern Qi Dynasty in (550–577) over 1,400 years ago. It was rebuilt and strengthened under the supervision of famous General Xu Da during the Ming Dynasty on the foundation of the Northern Qi wall around 700 years ago. Mutianyu Pass was fortified in 1404 (the 2nd year of Emperor Yongle&apos;s reign) with a rare triangular formation of three interlinked watchtowers. A 2½-kilometer section was fully restored in 1986. Today’s wall is a replica of the fortifications of 1568 in the Ming Dynasty. Densely spaced watchtowers: 23 watchtowers, about one every hundred meters on an ascending mountain ridge. Both sides of the wall have a crenellated parapet so that soldiers could fire arrows at enemy at both sides. This is very rare on other sections of wall. Under the westernmost towers, on the side of a grassy ridge, is the 200-meter-long phrase 忠于毛主席 — ‘loyalty to Chairman Mao’ (zhōng yú Máo Zhǔxí /jong yoo maoww joo-sshee/). Chairman Mao once wrote: ‘If you don’t get to the Great Wall you’re not a good man.’ (不到长城非好汉) So touring the Great Wall could be said to be showing loyalty to Chairman Mao. 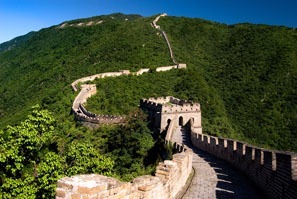 It is the longest and best fully-restored Great Wall section open to tourists. The Great Wall at Mutianyu is less crowded and has better architecture than at Badaling, with more watchtowers. There are cable cars up and down, making it very easy to visit. With the greens of pines and cypresses covering ninety percent of the surrounding area, the scenery there is beautiful all the year round. The best time to visit Mutianyu’s Great Wall is in spring and autumn. In winter, it is chilly in the wind, and could be quite slippery on the wall when it snows. In summer, it is hot and there is full exposure to the sun on the wall. 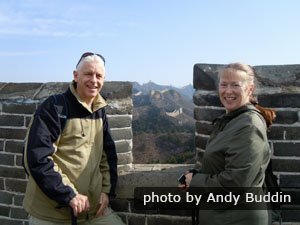 Click here for what you can expect on the Great Wall in different seasons. 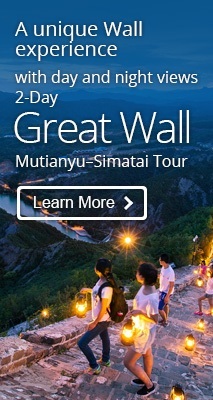 Getting to Mutianyu: Independent, Group, or Private Tour? Mutianyu is about 1½ to 2 hours’ drive from central Beijing. There is no convenient public transportation from Beijing to this part of the Great Wall. Going Independently — public transport is full of hassles, be patient! Traveling on your own you may meet a lot of hassles and trouble such as the language barrier, lining up for tickets, and figuring out the best travel routes. China&apos;s public buses (that go out to the countryside) are always packed, so if you do plan to take a public bus, be prepared for trouble getting a seat. No English is spoken. Bus 867 runs from Dongzhimen (东直门长途旅游汽车站) to Mutianyu at 7:00am and 8：30am (on weekends and public holidays, not available at workdays), and returns at 2:00pm and 4:00pm. It is a 2½-hour journey. The bus only operates from March 15 to November 15, with no service in winter. The limited service means severe competition for a seat on the bus. Bus 916 from Dongzhimen to Huairou Town plus local minibus to Mutianyu is the fastest public transportation option: about 2 hours. Bus 916 runs frequently — about every 20 minutes. Many companies provide one-day group tours to Mutianyu, though there are fewer group tours to Mutianyu than Badaling. These tours usually include a visit to the Ming Tombs afterwards, in the afternoon. There are souvenir factory visits during the tour for commissions. A group tour will get you there in a coach full of Chinese tourists. You may have to go to a designated hotel to catch the coach, and then walk at the slow pace of a noisy crowd on the wall. The most pleasant way is, of course, to take a private tour. Our guide and driver will wait for you at your hotel lobby and transfer you to the wall by air-conditioned car. A private tour means more flexibility, and you will be taken care of by your private guide and driver. 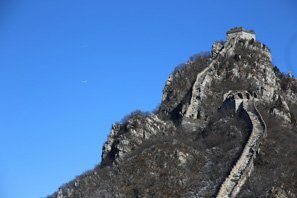 Though better than Badaling, the wall is crowded in some places some of the time, and traffic jams can happen on the way. But our guide knows how to escape the crowds and the traffic jams! Your guide will arrange your entry tickets (in advance), saving you a lot of time and trouble lining up. The wall is crowded in the morning so our one-day Mutianyu Great Wall tours go in the afternoon to avoid the crowds and traffic jams. Hike up: Allow around one hour to climb the 4,000+ steps. 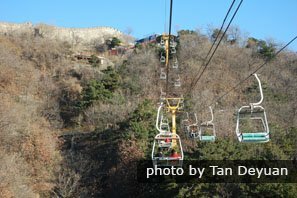 Chairlift / cable car: There are two-rider chairlifts and four-rider cable cars for travelers to choose from to ascend or descend. Toboggan: For those who really want to trek miles more for the experience, single-rider toboggans descend (at a safe speed) from the east end of the wall to the valley. We suggest our customers take a cable car or chairlift up and down, because the cable car station is in the middle of the wall close to tower 14. Walking west from tower 14 to tower 23, you will see the most beautiful scenery. The path up goes to tower 8 or 10, which means you will need to walk an extra kilometer (half mile) on wall with comparatively plain scenery to get to the best part. Mutianyu is a “wheelchair-friendly” section of the Great Wall. Your wheelchair can travel unimpeded to the cable car station by a smooth uphill path. 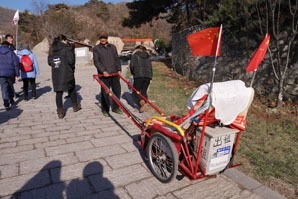 Or you can hire a rickshaw at Mutianyu to help you get to the cable car station. After the cable car journey, you will reach to a platform below the 14th watchtower. You can appreciate the beautiful scenery of the Great Wall from there. You can also ascend another path with barrier-free access to touch the Great Wall at the watchtower. 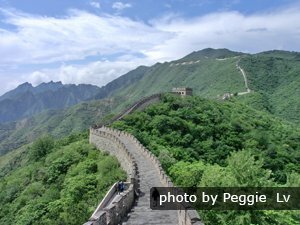 Mutianyu Great Wall Hiking: Mutianyu–Jiankou or Jiankou–Mutianyu? Easy walking: one hour up to Jiankou, and then 4 hours down to Mutianyu (instead of 4 hours up and 1 down!). Walk from the wild, rugged wall to the restored wall; beginning with the difficult part when you are energetic and fresh, and finishing with the easy part. The Great Wall at Jiankou is in ruins with steep slopes and uneven underfoot, while the Mutianyu section is rebuilt with proper steps, and quite smooth underfoot. From quiet to more-visited, you can enjoy the best natural conditions while you are fresh. 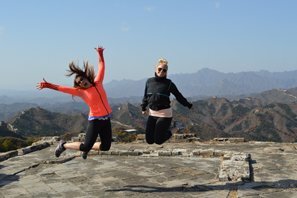 The Jiankou Great Wall section sees far fewer travelers than the Mutianyu part. By arriving at Mutianyu in the afternoon, you’ll also find most of the morning tour groups have gone. Interested?... See the Jiankou to Mutianyu Great Wall Hiking Tour page. 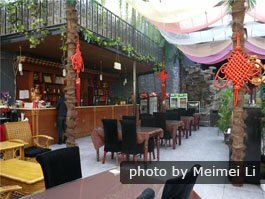 At the foot of the Great Wall, Xinshuangquan (/sshin-shwung-chwen/) is a garden-style restaurant serving “Westernized” Chinese food. Recommended dishes are sweet and sour pork, brocoli with garlic, and BBQ Fish. There are many local guesthouses and mid-level hotels concentrated in and around Mutianyu Village at the foot the Great Wall. Mutianyu Great Wall Villa and The Brickyard at Mutianyu Great Wall are good hotels to choose. Dress for hiking and dress for the weather. Choose comfortable footwear with good grip and support for the feet. Layers of clothes that can be taken on and off allow for greater comfort and temperature control. Wear/bring sun protection in the summer and dress for sub-zero temperatures in the winter. It can feel much colder on the wall than down in the valleys because of altitude and exposure. Bring breathable waterproofs for protection from rain and wind. Umbrellas may be used at Mutianyu, as the ascents and descents are not difficult, but may be inconvenient in strong winds. Bring a camera and money for souvenirs and refreshments. Bring snacks and water if you want to walk a long portion of the wall. You could have lunch in a local restaurant at Mutianyu or prepare a packed lunch before departure from Beijing. 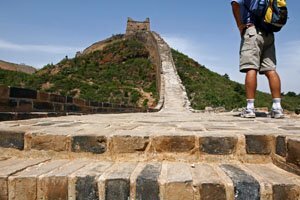 The paths, wall top, and steps of the Great Wall at Mutianyu are well-paved with granite slabs, and walking conditions pose no significant risks. 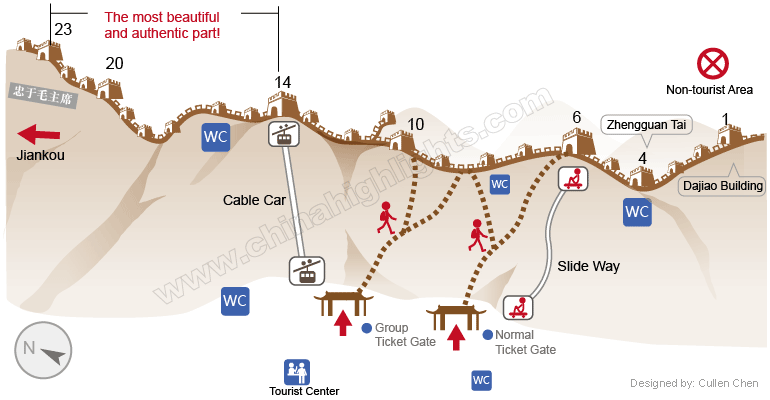 There is the option to use a cable car to avoid the trek up to the wall. 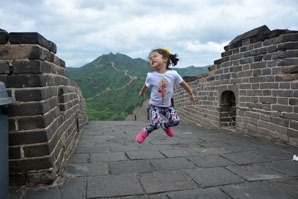 Mutianyu is the favorite section for exploring with (young) kids. We recommend taking the cable car up to Tower 14, walking down to Tower 6, and then taking the toboggan down. That’s something to look forward to! The kids will love it. 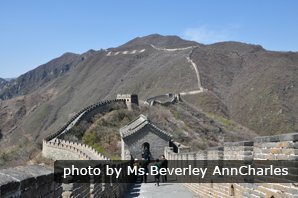 4-Day Essence of Beijing Tour with Mutianyu Great Wall Walking: best for first time visit to Beijing. Not interested in the above tours? 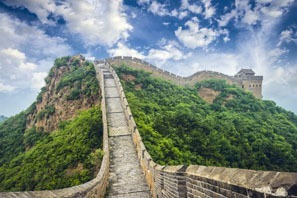 Check out more Great Wall hiking options, or just tell us your interests and requirements, and China Highlights will help you create your own Great Wall tour.